Ascenders & Descenders è un interpretazione tipografica del balletto di Merce Cunningham registrato da OpenEnded Group per il progetto loop. The piece is a Cunningham dance work reconstructed from textual deconstructions of other Cunningham dance works. Each finger has an associated excerpt from an article, review, or essay on Cunningham from the last 5 decades. These texts become the “ink” with which each finger manifests its movements. 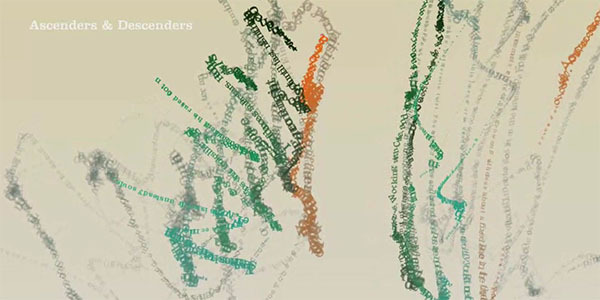 Each text is dynamically typeset in 3 dimensional space along the curves traced by his fingertips. The software keeps track of various movement parameters which it uses to modulate aspects of the visualization such as letter size, camera position, angle, and zoom. Merce not only dances the dance, but becomes typesetter and cinematographer, conducting the audience’s view of the dance.